The HD55 is designed for those applications where additional well depth or well casing size is needed. Although similar in power range to the HD2001, the HD55 uses a heavy duty frame and swivel necessary when working at additional depth. The HD55 uses the same frame as its heavier-duty stable mate, the HD77, and provides the ideal balance of power, features and portability for lighter commercial applications where maximum portability and a greater depth range are needed at an affordable price. 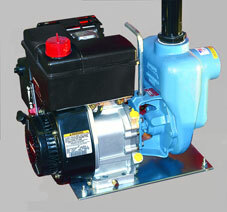 HD55 features a Briggs & Stratton 6.0 HP motor.